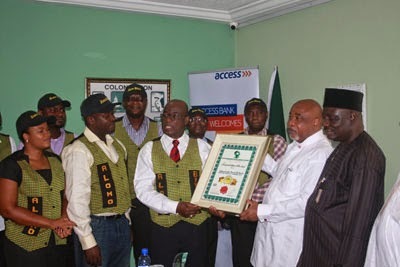 The management of Kasapreko Company Limited on Thursday dedicated their Medicinal Herbal Drink of the Year award to the Nigerian High Commission in Accra. The herbal alcoholic beverage company was adjudged the Medicinal Herbal Drink of the year 2014 at the Africa Product Forum organised by the Institute for Government Research Leadership Technology at Abuja in Nigeria. According to Kwabena Adjei, Group Chairman for Kasapreko, the award is testimony that Nigeria appreciates good things. “We dedicate this award to our loyal consumers the world over, especially in Nigeria, who have over the years enjoyed authentic natural bitters –Alomo from Kasapreko. Since the introduction of Alomo Bitters unto the Nigerian market about four years ago, our growth has been driven largely by consumer demand in Nigeria. Nigerians love Alomo Bitters for many reasons. Alomo Bitters is produced with hundred percent natural ingredients. We are working to expand our operations in Nigeria within the next couple of months with the introduction of some new brands,” Mr Adjei stated. The Nigerian High Commissioner to Ghana, Ambassador Ademola Oluseyi Onafowokan, who hosted some management members from Kasapreko at his office, stated that out of the 170 million people in Nigeria, over 60 million of them drink Alomo. “When I came to Ghana and I discovered that Alomo was made in Ghana, I was shocked because I thought it was made in Nigeria. I’m very proud that Nigeria and Ghana are getting it right. Africans have started trading with each other and it is with a lot of pleasure that I will like to say that today Nigeria is Ghana’s biggest trade partner. Nigeria has a population of 170 million, at least 60 million of them will drink Alomo,” Ambassador Onafowokan said. He urged the Kasapreko Company to extend their market beyond Nigeria to the rest of West Africa. “I want to say many congratulations to you all for your achievements. Keep the boat of Alomo sailing and raise the flag higher. But we can take it further than that. There is a huge market in West Africa, which I think Alomo should reach out to. Today is a special day in the sense that the award given in Nigeria by the institute of leadership will be represented by Alomo to make it very authentic and a symbol of Ghana-Nigeria relationship. I personally as a person, I’m very passionate about trade and investment promotion; and being posted to Ghana, I see myself as a commercial ambassador of international commercial exchange,” he said. Kasapreko also donated some boxes of their product to the Nigerian High Commission as a sign of goodwill. I am a Creative Arts Writer who is also into Strategic Communications, Public Relations, Photography and IT consultancy. I am also Social media enthusiast and an alumni of the Ghana Institute of Journalism (GIJ). Madina – Adenta – Aburi Highway... Blessing or Curse? M.anifest & Olamide Join Forces on "Fine Fine"